get your personal space: spike away | Abler. 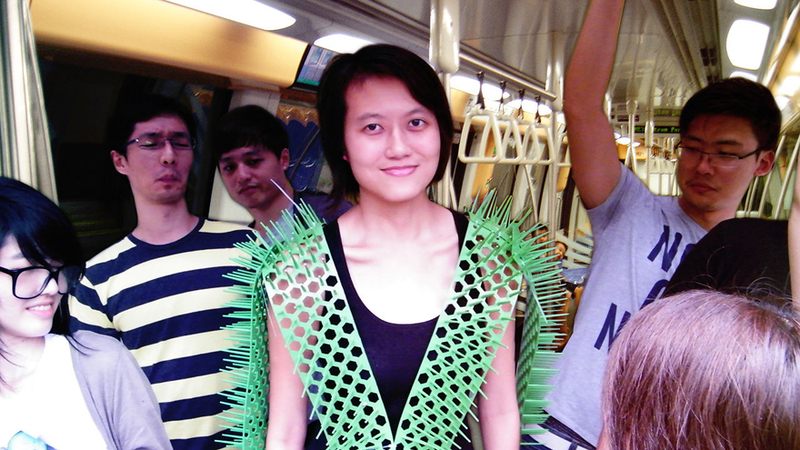 Industrial designer Siew Ming Cheng‘s “Spike Away” is your commuter-dream-come-true: a wearable way to guarantee you won’t be up close and personal with the next person’s breath and music and perfume. ​Core77 reports that Cheng was part of a 2-day workshop on design addressing mundane problems, and she came up with this—a way to keep strangers at bay in crowded situations. This is the kind of project dealing with everyday realities: wishes left unsaid, ideas unexpressed. What *would* be the right amount of space granted, and the right amount of flexibility for those around you? It’s hard to say, exactly, but these devices start to imagine that negotiation. Made from pre-fabbed strips of material designed to keep pets away from plants, these are wearable defensive mechanisms, for those brave enough to use them. More from Siew Ming Cheng. Pingback: Who’s afraid of chronic illness as disability? An entire field, apparently. | It's complicated.